Samsung has announced a new device called HomeSync which will allow up to eight user accounts to share media to your TV. The new Samsung HomeSync is a new media hub with a lot of power under the hood. Running Android Jelly Bean, this new device has 1GB of RAM, 8GB of Flash memory, a 1TB HDD, runs up to 802.11n on 2.4 and 5GHz bands, Ethernet port, HDMI 1.4 output and has BLuetooth 4.0. It can support up to eight password protected accounts for family members to place their content on it and get it on to the television. Don't have your own content? No worries, it also supports the Google Play store. No word yet on pricing, but its due for release in April. 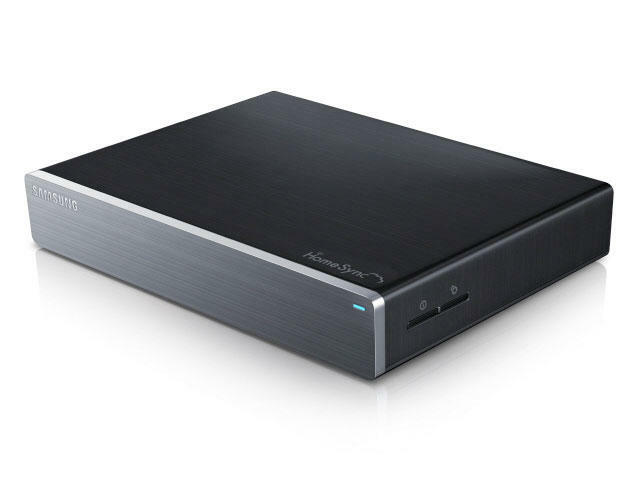 HomeSync's 1TB drive can help you sync to multiple devices, providing shared or private storage for all your content. It supports eight separate accounts to cover a whole family, and allows each user to upload and download content from multiple devices and instantly share with other family members. File encryption and user-specific ID and password ensure content in a user's private area remains separate from the shared area in HomeSync. Users can enjoy the full and familiar Android experience with HomeSync's Jelly Bean media player and access to Play Store and all of your apps. HomeSync also enables new ways to interact with your content via the control modes enabled wirelessly on the phone. ＊All functionality, features, specifications and other product information provided in this document including, but not limited to, the benefits, design, pricing, components, performance, availability, and capabilities of the product are subject to change without notice or obligation. ＊Android, Google, Android Beam, Google Search, Google Maps, Gmail, Google Latitude, Google Play Store, Google Play Books, Google Play Movies, Google Plus, YouTube, Google Talk, Google Places, Google Navigation, and Google Downloads are trademarks of Google Inc.